A week after the English attack at Arras the French launched what is often called “The Nivelle Offensive", better known to the Germans as the "Doppelschlacht an der Aisne und in der Champagne". The initial attack stretched from Vailly (14km’s east of Soissons) to Reims. The day after attacks to the east of Reims followed. The Generalkommando XV. bayerische Reserve Korps (G.K. XV. b.R.K.) had been expedited to the sector under the command of the 7. Armee Oberkommando (7. A.O.K.) and had taken it’s place in the line between Craonne, curving southwestwards through the forest to the south of la Ville aux Bois (Viller Wald) continuing over the road crossing two km’s to the northwest of Berry au Bac and ending on the Aisne at Berry au Bac. Under the command of the G.K. XV. b.R.K. were the bayerische Ersatz Division (b.E.D.) and the 9. and 5. bayerische Reserve Divisions (b.R.D.). Since the autumn of 1914 the sector of the 7. A.O.K. had been relatively calm. Badly battered divisions had been rotated there to recuperate. Lacking the means available in other sectors, strong defensive positions, bunkers, communications trenches and other elements needed to successfully beat off a determined enemy attack were absent. As the enemy’s intentions had become apparent in the winter of 1916 the Germans were working hard to remedy the situation. The G.K. XV. b.R.K. had arrived from Lorraine on the first of March and took up quarters at Sissonne. The first order of the day was to prepare to meet the coming assault. The greatest importance was placed on the positioning of the artillery, the intention being to destroy the enemy in his staging areas. The gunners prepared themselves. They would soon do their part. The 213. I.D., positioned behind the G.K. XV. b.R.K., went through a special training program to prepare the men to meet the French attack with a counterattack. From the beginning of April the French artillery and mortars began to bark. The German batteries, supported by flying observers, responded in kind. The situation was soon similar to that which was found at Arras. Already by the 12th of April the positions were severely damaged. To the rear there had been much destruction as well with stations and crossroads under constant fire from the enemy's long range artillery. On the morning of the 15th of April the enemy signalled his coming attack with a heavy gas barrage and drumfire which started that evening. The Germans readied for an attack the next day. The Bavarians in the trenches prepared themselves as did the 213. I.D. and 50. I.D. (arriving on the ninth of April) which were in the G.K. XV. b.R.K. sector ready to counterattack. That night the German artillery put all its efforts into bombarding the French staging areas in order to disrupt the attack at the outset. Above: The opening stages of the Battle on the Aisne. During the night there was a lull in the French fire but in the early morning on the 16th April the full fury broke loose again. To the German troops who had spent days shivering in their trenches the slight lull had brought no relief. Their nerves were stretched to breaking point and it was only at 07:00 when the French attacked that they felt a strange sense of relief. Between Vailly and Reims the attack started, infantry accompanied by tanks, field artillery, airplanes and even cavalry. General Nivelle had set his troops some spectacular goals for the first day of the offensive. Concentrating his assault troops he hoped to smash through the German lines which should have been weakened by days of artillery fire. Four divisions marched against the positions of each, the b.E.D. and the 9 .b.R.D., staggered in two waves. It can be assumed the 5. b.R.D. faced a similar number of attackers. 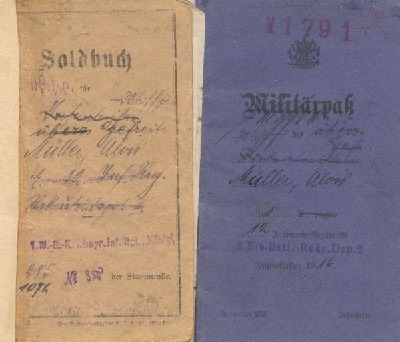 Right: The Military Pass and Paybook of Alois Müller. 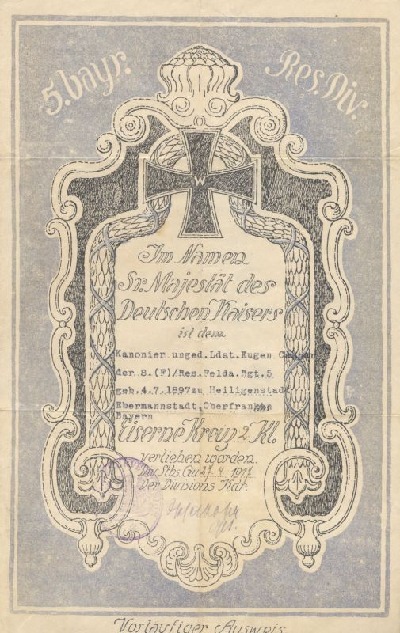 Müller was a machine gunner in the 15th Bavarian Reserve Infantry Regiment (mentioned in the text below) and recieved the Iron Cross 2nd class for his part in the battle on the Aisne. In May he recieved a battlefield promotion to Unteroffizier for bravery in the face of the enemy during the fighting on the Aisne. The bayerische Reserve Infanterie Regiment 4 (b.R.I.R.4) of the b.E.D. on the right flank absorbed the first thrust of the attack in their sector and in the process lost a part of the Craonne ruins. The men in the western and northern parts of the village held their positions and with the support of their machine gunners they mowed the attackers down as wave after wave clattered over the rubble. Following a counterattack they managed to take back much of the lost ground. To the east of Craonne the French made minimal progress in the b.R.I.R.15 sector. The right wing of the Regt gave ground exacting heavy losses from the attackers but the left wing and the neighbouring Ersatz Infanterie Regiment 28 (E.I.R. 28), straddling the road Pontavert-Corbeny lost no ground. The bayerische Ersatz Feldartillerie Regiment (b. E.Fda.R.) and other batteries attached to the b.E.D. had the situation in hand. Enemy tanks advancing along the Pontavert-Corbeny road were destroyed at a distance of 800 meters, already at 09:00 the French attack had ground to a halt while the rolling barrage they were following continued on to the heights around Corbeny. The Horizon Blue uniforms of the dead Frenchmen lay in piles in front of the positions of the b.E.D. and 300 prisoners had been taken. Left: An Iron Cross award document to a gunner from the 8./b.R.Fda.R.5 who recieved his award for the action at Guignicourt mentioned below. An extremely hard attack was launched at the left wing where the 8./b.R.Fda.R.5 was in position about 1500m. Southwest of Guignicourt between the road to Berry au Bac and the Aisne. 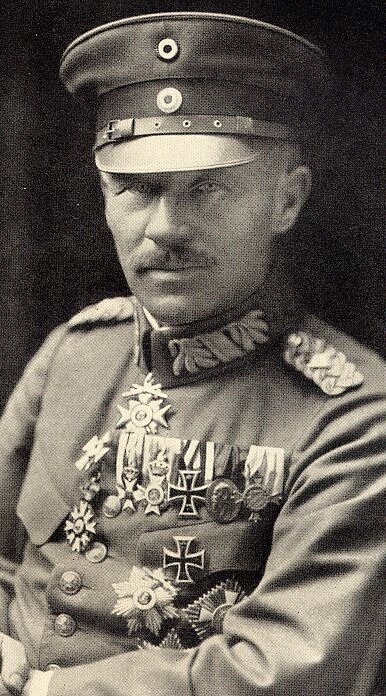 Under the calm orders of Leutnant Ibach the battery engaged enemy assault troops in the fields along the Aisne over open sights. The enemy, who had made it to Guignicourt was hit from the rear and seven tanks were destroyed at close range. Finally the artillery position was overrun. The 2. and 7./B. R.Fda.R.5 who had taken up position just behind the trenches fired until the last moment but were swamped by the enemy attack as well. The 9. b.R.D. had, although her right wing was not yet secure, engaged her counterattack reserves (men of the 50. I.D.) early in the battle. The Prussians of the III. and I./I.R. 53 had been sent to Juvincourt and on the heights to the north of the village the guns of the II. and III./Fda.R.99 had been set up. 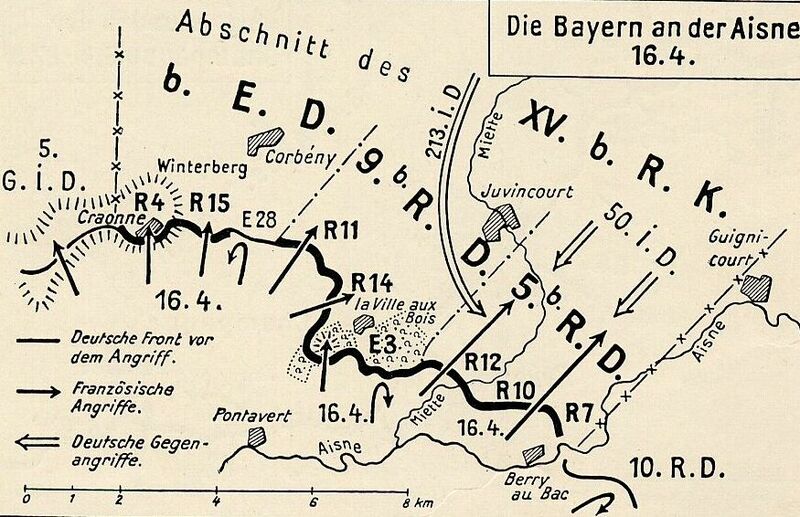 At midday, with the help of elements of the the b.E.I.R.3 and the b. R.I.R.12, it was possible to stabilize the front on both sides of the Miette, break the back of the enemy's attack and save the artillery. The divisions had been forced to use their reserves early in the day and the G.K. XV. b. R.K. was already requesting authorization from the A.O.K. to release the rest of the 50. I.D. and 213. I.D. as early as 09:00. It took until 10:00 to get through and the A.O.K. 7 authorized the use of the counterattack reserve. The seven battalions of the 213. I.D. were on the road from Amifontaine, marching towards la Ville aux Bois. At approx. 15:00 they were to the west of Juvincourt. Here they swung to the southeast, met the enemy that was in the artillery positions and threw him back into the Miette river. The unused four battalions of the 50. I.D. marched through the forest three km’s southeast of Amifontaine and that evening joined the remains of the 5. b.R.D. to the southeast of Juvincourt. They were unable to force the enemy out of the captured artillery positions. By nightfall the danger of a breakthrough in the G.K. XV. b.R.K. sector had passed. The advance elements of the 2. Garde Infanterie Regiment (2. G.I.D.) and 21. R.D. were arriving in Amifontaine and to the South of Lor. That night the artillery of the 5. b.R.D., whose individual batteries had fired up to 4000 rounds each that day, was retired to the second line of defense, running from Aizelles over Damarcy to Guignicourt.